Bertalan de Némethy (Feb. 24, 1911 – Jan. 16, 2002) was a cavalry officer in Hungary and later became the show jumping coach for the US Equestrian Team. Additionally, he was extremely influential in developing many of the riding and training methods used by show jumpers today. De Némethy began riding as a child in Gyor, Hungary. He began competing in show jumping in his teens. Due to his uncle’s employment as a cavalry officer, de Némethy attended the Military Academy of Ludovica, in Budapest. He then entered the cavalry, riding six horses each day at the school, beginning with dressage horses, before having a lesson on the longe without stirrups, and then riding young horses cross-country. In 1937 he became an instructor. He was sent to train at the German cavalry school in Hanover, the first Hungarian officer to do so. There he was taught by the likes of Otto Lörke, Fritz Stecken, and Bubi Günther, and learned the German system of training horses. World War II forced de Némethy to return to Hungary, but as the Russian Army approached Budapest, he and his fellow cadets decided to flee, they went to Denmark. De Némethy remained in Copenhagen for six years, employed as a riding instructor. In 1952 he emigrated to USA, where he began teaching and designed jumping courses for various horse shows. 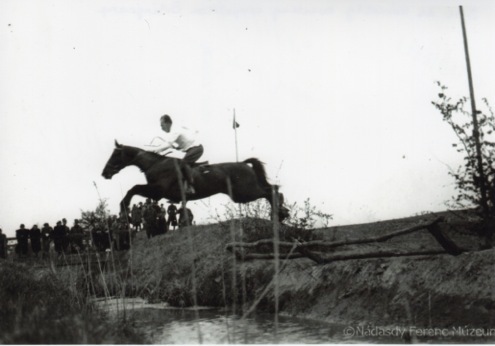 In 1955, on the advice of William Steinkraus and Arthur McCashin, de Némethy was asked by the US Equestrian Team to become the coach for the jumping team. De Némethy accepted the position, holding it until 1980. During this time he trained famous riders like George Morris, Joe Fargis, Frank Chapot, Kathy Kusner, Leslie Burr, Conrad Homfeld, Michael Matz, Melanie Smith, Neal Shapiro, and William Steinkraus. He based his training on dressage work, jumping grids, and longeing, all of which was published in his classic book The de Némethy Method. While he was their coach, the US Show Jumping Team won the team silver at the 1960 and 1972 Olympics, the 1968 individual gold, and the 1972 individual bronze. Additionally, all four riders on the 1984 gold medal-winning team had been trained by de Némethy. After coaching the US Team, de Némethy was much sought-after as a course designer. He was inducted into the Show Jumping Hall of Fame in 1987.